Agents have seen it all when it comes to hiding drugs like heroin. Here’s the latest hide-and-seek game where the dealers lost. NEW YORK –– They don’t stock this option at your local Build-A-Bear store. 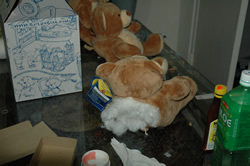 Authorities announced Saturday a massive heroin bust in the Bronx, where dealers were moving millions of dollars in dope inside Build-A-Bear dolls. The drugs were packaged in tiny glassine bags branded with names like Barack Obama, Swine Flu and Crime 360, a nod to a detective series on A&E. “The agents walk in and there’s heroin and all the dime bags and the Build-A-Bears just sitting there,” said Erin Mulvey, spokesman for the Drug Enforcement Administration. State, local and federal law enforcement officers seized 33 pounds of heroin with a street value of about $33 million and arrested 12 people on Friday. The suspects were waiting to be arraigned late Saturday. Posted: 7/6/09 at 10:46 PM under News Story.